Rent Della Terra Mountain Chateau | Corporate Events | Wedding Locations, Event Spaces and Party Venues. Della Terra is located above Estes Park at the Fall River entrance to the Rocky Mountain National Park. The Chateau rests at the top of the wooded acreage, surrounded by untouched nature. Della Terra offers fourteen luxury suites featuring fireplaces and private balconies with hot tubs, a lodge room with three-sided stone fireplace and waterfall, private spa treatment room, dry heat sauna, styling salon, espresso bar, library and theatre room. The suites feature sitting nooks with arched windows, see-thru fireplaces, soaking tubs before romantic water features, walk-thru jetted showers and private balconies with hot tubs. Della Terra expressed through the Italian language translates to “of the earth”. Each suite is designed to celebrate and embrace the earth's elements, seasons and skies. Della Terra is a place where natural beauty and romantic design come together to create the perfect secluded mountain venue for your wedding ceremony and reception. 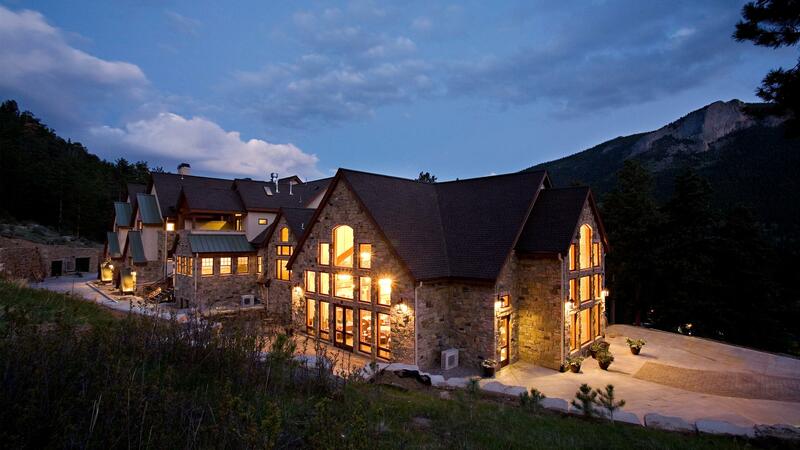 Luxury lodging in the Colorado Mountains. Della Terra offers fourteen romantic luxury suites featuring fireplaces and private balconies with hot tubs, a lodge room with three-sided stone fireplace and waterfall, private spa treatment room, dry heat sauna, styling salon, espresso bar, library and theatre room. Romantic luxury at every turn of this Colorado bed and breakfast. Della Terra luxury suites feature sitting nooks with arched windows, see-thru fireplaces, soaking tubs before romantic water features, walk-thru jetted showers and private balconies with hot tubs. Della Terra expressed through the Italian language translates to “of the earth”. Each suite is designed to celebrate and embrace the earth's elements, seasons and skies.